“If you are ever going to own those Vixen’s, now is the time.” It was “now” because in less than a month I was heading back to Namibia for a third time, for a full two weeks as the resident astronomer at the &Beyond Sossusvlei Desert Lodge, which is located in the NamibRand nature reserve and has an International Dark Sky Association gold rated sky. This conversation was with a fellow member of the Baker Street Irregular Astronomers at the monthly star party in Regents Park. I had been rather vocal about my intrigue on Twitter and Stargazers Lounge when Vixen launched the SG 2.1×42 binoculars into the UK market earlier in the year but due to a very busy summer at work had promptly forgotten all about them. I was initially resistant to the idea of yet another purchase in anticipation of this trip as I had already purchased the Takahashi FS-60 and a new light weight tripod and head for use in Namibia. Unfortunately for my wallet, the Irregular in question (as we call ourselves) was Tom Kerss, an astronomer at the Royal Greenwich Observatory and former resident astronomer at the Lodge in 2010. So he was well aware of how good the skies were. “These binoculars were made for scanning the Milky Way, and you know how good it is there… You will regret if you don’t.” Tom was right. The Milky Way stretches from horizon to horizon, and at the time of year I would be visiting, Sagittarius and the galactic centre are almost overhead in the early evening with all the wonderful nebulae and clusters that pepper that region of the sky. I said I would sleep on it, but the truth was I had already made up my mind. The following morning I placed an order with Tring Astronomy Centre who had just taken a fresh delivery and the next day they were in my possession. The price was £229. 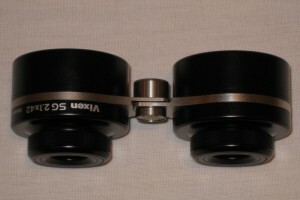 Vixen made quite a splash when the Miyauchi co-developed SG 2.1×42 binoculars launched, but at the same time it was clear from many of the questions being raised in online forums that there was some confusion about how they worked; principally around the exit pupil and the apparently oversized apertures. Telescope optics in use today are decedents of the Keplerian design which uses an convergent objective and a convex lens as the eyepiece. The advantage of this is that the emerging light rays are converging which provides for wider fields and greater eye-relief but the image is inverted. The concept of exit pupil arises from the Kepler optical design which is calculated as telescope aperture divided by magnification. In the case of the SG binoculars that would be 20mm (42mm/2.1x). At first glance that would indicate a lot of wasted light not making it to the observer’s retina as maximum pupil dilation is approximately 7mm. The follow on conclusion is that the maximum practical application for the aperture is only 15mm. 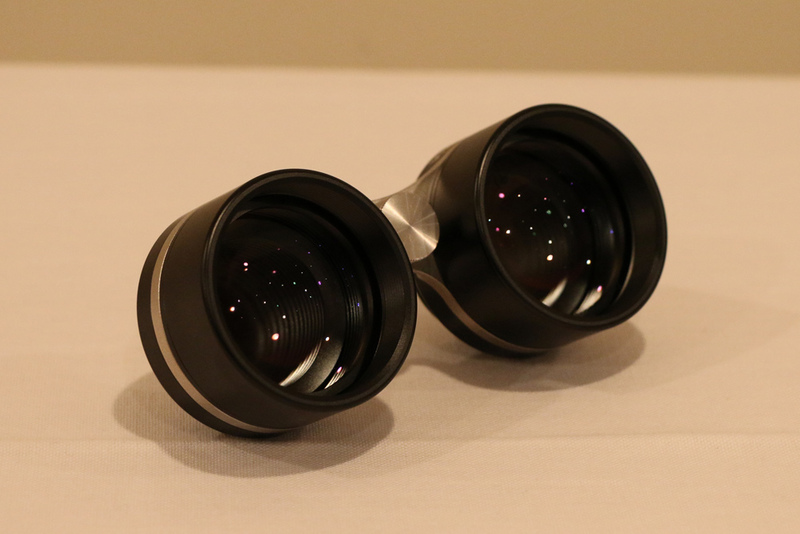 A natural question to ask is “why make the customer pay for oversized lenses?” The retort was it was likely cheaper to fabricate larger lenses as the tooling would already exist. While that may be true, it is not the primary basis for producing these binoculars with 42mm lenses. The reason being they are of a Galilean optical design and work a little differently. The Vixen SGs employ the same optical arrangement as used by Galileo Galilei in 1609, and this is where the name derives from. That scope utilised a convergent objective and a divergent eyepiece lens. As the design has no intermediary focus, the produced image is upright and not inverted. Unlike a Keplerian design the exit pupil is virtual and located inside the optical train. Parallel rays from a distant object are brought to a focus on the focal plane and those light rays are intercepted by the divergent eyepiece lens which renders them parallel once again. Non-parallel light rays will travel at a larger angle after they pass through the eyepiece. This increase results in an enlarged apparent angular size and is responsible for the magnification achieved. The interception of the non-parallel rays is impacted by the distance between the objective and eye lenses meaning there will be a variation in magnification achieved for any individual who is near or long sighted. The quoted 2.1x magnification is for infinity focus for a user with no eye prescription. So why use 42mm lenses? In a Galilean system, the actual field of view scales linearly with objective diameter. As such, for any given power, a doubling of the objective diameter results in the real field doubling. As the exit pupil is virtual and located inside the optical system there is no fixed eye point and hence to maximise the field seen, the eye must be placed as close as possible to the eye lens, with the obvious implication for spectacle wearers. 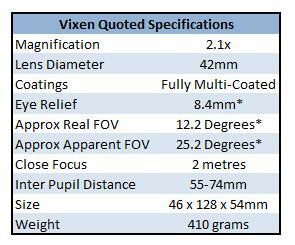 However, the Vixen SG have fairly generous sized eye lenses which provides a more comfortable “eye relief” (stated as 8.4mm) without cutting off parts of the achievable field of view. The question of light grasp and magnitude gain is not approached in quite the same way as a Keplerian telescope. The magnitude gain of a telescope (ignoring the benefits of darkened sky background) can be calculated as 5 x Log10 (D1/D0) where D1 is the diameter of telescope’s primary objective and D0 is the diameter of the eye’s dark adapted pupil. In a low power Galilean system, the light grasp is dependent on the magnification and light transmission. For the sake of simplicity, if we assume that the transmission efficiency is 100%, the Vixen with their magnification of 2.1x results in the effective increase in your pupil diameter by 2.1x, and as such the increase is 2.12 which is 4.41x more light. The magnitude gain is given as Log10 (4.41) x 2.512 = 1.62. If we assume 95% transmission, that factor is applied to the light grasp gain and results in magnitude improvement of 1.56. Upon removing the SGs from their small padded case, the first thing that strikes you is the heft. At 410 grams, they cannot be called heavy, but they certainly feel solid and exude a feeling of high quality. Any connection to the cheap, plastic opera glasses released with a pound coin from the back of a seat in a theatre ends with the shared optical design. The Miyauchi influence is obvious which is also revealed by the proud livery “Made in Saitama” (Japan) around the barrel. While the eye lens caps are snug fitting, the objective lens caps are a little looser but not so much there is any chance they would fall off. Removing the rubber caps reveals exquisitely coated optics. Close inspection revealed no streaks or variations in thickness and examination of the muted reflections of a bright light source showed each surface has been individually coated and backs up the claim the SGs optics are fully multi coated. The SG coatings are of the class I would expect to find on a Vixen telescope. Objective lens view of the Vixen SG 2.1×42 binoculars. The reflections come from the 24 lights on my ceiling. The inside of the barrels are matte black and have a series of small baffles to eradicate stray reflections which can reduce the all important contrast, which is key for any type of astronomical observation. Each lens and eyepiece assembly pivots around the central axis which is made of metal and the action of adjusting for inter-pupil distance is very smooth along the entire adjustment range of 55 to 74mm (2.16 to 2.91 inches). Located at the pivot point is a small removable metal cover which reveals a standard thread for a binocular mounting though at only 2.1x and 410 grams I am not sure why anyone would want to mount them. It should also be noted that the separation between the objective lens housings is such that a narrow binocular mount would be needed. My own Opticron 31005 binocular mount is too wide. Though the binoculars are not heavy, they are also fairly narrow with not too much to grip. Fortunately they come with a thin neck strap which attaches via a small hole on the left lens assembly. I would not carry them around just hanging from the strap, but it is a nice safety net to have in case they slip your grasp. Each independent focus ring is large with a dimpled finish providing a firm grip. The focus action is as smooth as any binocular I have used. The SG benefits from independent focusing rings on each barrel and the action is as smooth and precise as any binocular focuser I have ever used. The literature published by Vixen states that near focus is approximately 2 metres. I am very fortunate to have 20/10 vision and my own tests reveal this is closer to only two feet as I am able to focus on the computer monitor in front of me as I type this review, though it was right at the limit of the focus mechanism. This close focus test also reveals how the magnification varies with focus position. The day the Vixen’s arrived it was cloudy but I could not resist a quick test so I directed them towards my 36” television and was immediately impressed with the image sharpness across the central 50-55% of the field of view. However, beyond that the image distortion increased rapidly. Using the stars from the Alpha Lyrae logo in a parallel line formation demonstrates the curvature and blurring of the image towards the edge of the field. Using a series of parallel Alpha Lyrae logo stars demonstrates the field distortion. 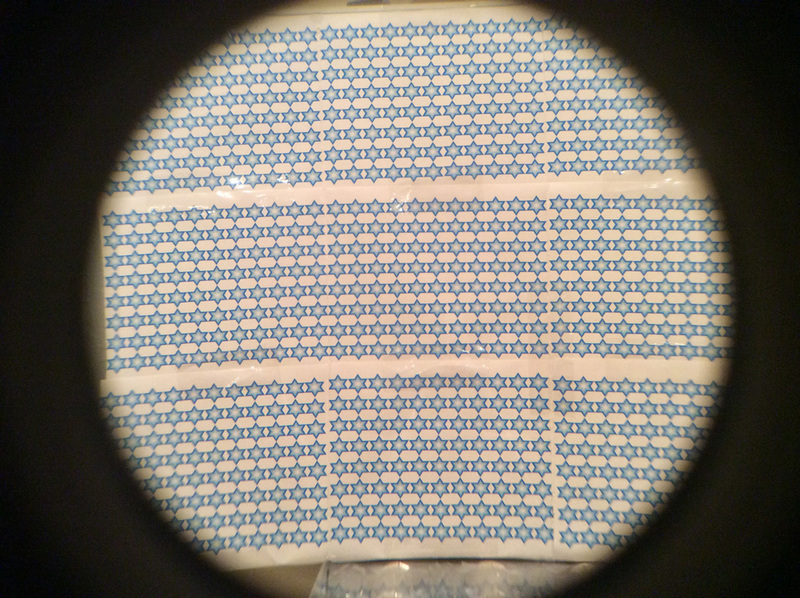 Reflections on the stars are sellotape used rather than optical aberrations. The Kalahari and NamibRand desert in Namibia are some of the driest places on earth. The “rainy” season usually begins in December but I was unlucky enough to witness three successive nights of heavy thunderstorms when I arrived at the Sossusvlei Desert Lodge in mid September. Something that is almost unheard of. The magnitude +7 gold rated skies were tantalising out of reach for what felt like an eternity. However, upon waking on the fourth morning I was greeted by views of beautiful blue skies. The wait to reacquaint myself with the southern skies and glorious Sagittarian Milky Way was coming to an end and the first view through the SG 2.1x42s almost made the delay worth it. That night all the guests had retired to bed by around 10:30pm leaving me, a 12” scope and my new Takahashi FS-60 free to explore all the treasures we cannot see at mid-northern latitudes. However, the splendour of the Milky Way was too much to resist so I powered down the 12” and took out the Vixens. WOW! The subtle and delicate light of the Milky Way was transformed. The view took on an almost 3-D appearance with the dark lanes that bisect the star-clouds seeming to float above the Milky Way star fields, themselves far brighter and revealing detail only hinted at with the naked eye. I felt like I had been wearing sunglasses when viewing the night sky and now had taken them off. The magnification is so slight that you do not really notice it and the view quickly becomes very natural, just enhanced, so that you almost forget you are using optical aid. If Superman (or an owl!) looks up at the night sky, this must be what they see. The impact of the SGs goes beyond those first views that stunned me. As I continued to study the Milky Way, all those subtle bright patches in the star-clouds that indicate the presence of a DSO, show far more detail. M7, Ptolemy’s Cluster, resolves into a pretty open cluster of numerous stars like tiny diamonds lying on the blanket of the Milky Way. The same benefit was seen with the Lagoon Nebula and numerous other DSOs. I lost many hours to just exploring the heavens with this “super-vision” over the remaining ten days I spent in Namibia. Aiming the SGs is very simple; you just look naked eye at the area of interest and then raise the binoculars to your eyes. With such wide-fields, you never fail to hit the target. Thanks to the light weight and low magnification there is no issue with image shake that can plague handheld binoculars and they are not fatiguing to hold for extended periods, though I did find myself using a recliner at the observatory and then losing myself fully in the view. The field does not increase appreciably by placing your eye ever closer to the eye lens which gives credence to the stated eye relief figure, thanks to the large eye lenses. For over a decade I have been very fortunate to own some of the best wide-field eyepieces available. Those wide-fields, whether I realised it or not, have actually taught me to observe in a way I did not when I purchased my first scope that came with cheap eyepieces with narrow fields and poorly corrected edges. Now rather than move my telescope, I just adjust my gaze to take in any part of the field of view. To use the Vixen’s most successfully, you must unlearn what you have learnt. With the quality of the image dropping off rapidly beyond the central 50% of field, the observer must look straight ahead at all times and move your head rather than your gaze to inspect any part of the field that is not centrally located. My experience suggests that the drop off in image quality is lost to peripheral vision and only adds to the sense of immersion. This slight adjustment to observing style took a little while to become second nature but once it did, it felt quite normal. After enjoying the feeling of super-vision for several nights, I spent some time evaluating the optical performance. As mentioned, the sharpness drops off beyond the central 50% of the field (an inherent quality of the Galilean design rather than poor fabrication) but I saw no other artefacts that would detract from the view such as flaring on bright stars or ghost images. At only 2.1x, chromatic aberration is hard to evaluate, but on a last quarter Moon, I saw no real evidence of it. 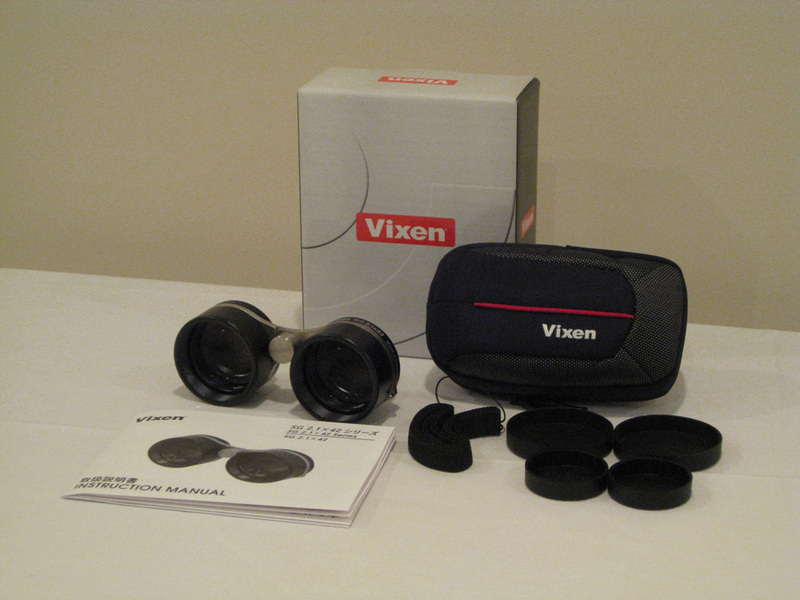 Repeated use of the binoculars led me to note that field of view seemed substantially larger than the specifications quoted by Vixen themselves. Scanning the central Milky Way I was able to fit the entire constellation of Scorpious in the field with stars in the stinger and claws right on the edge of the field of view. These stars are separated by nearly 30 degrees, far more than the 12.2 degree field stated by Vixen. I was able to do the same with Orion later in the night with both Rigel and Betelgeuse comfortably in the field. The apparent field of view is also far larger than the quoted 25.2 degrees. At around 28-30 degree real field, the apparent field would be approximately 60 degrees and this is certainly the impression I had. Having used 30 degree apparent field eyepieces, I find them almost claustrophobic and the SGs were very immersive, commensurate with a large apparent field. Such a divergence between quoted and real world performance left me wondering why Vixen stated such conservative estimates of performance? The specification table has an asterisk next to three numbers; eye relief, apparent field and real field but the foot note only mentions “the eye relief figure quoted is to give glasses wearers an idea of whether these will suit their visual set up.” Given the real and apparent field drops with eye distance, I wondered if the numbers provided were all related to glasses wearers. Curiosity got the better of me, so upon returning to the UK I purchased a pair of cosmetic glasses so I could hold the binoculars at the distance from my eyes that a spectacle wearer would. The decline in real and apparent field was immediately obvious. 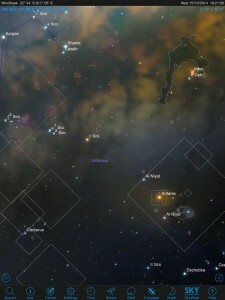 I was able to place Gienah and Al Fawaris, the two bright “wing” stars in Cygnus on the edge of the field. These stars are separated by 16 degrees. This is certainly a substantial drop and far closer to the fields quoted, so if you suffer from astigmatism and need your glasses for observing, keep that in mind. 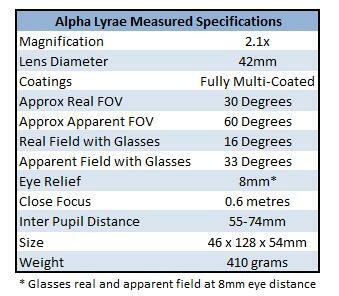 Alpha Lyrae measured performance for both naked eye and glasses wearers. A useful test for limiting magnitude for northern hemisphere observers is to count the number of stars visible inside the pan of the saucepan asterism in Ursa Major, framed by the stars Megrez, Phecda, Merak and Dubhe. From a darkish site I estimate to be approximately magnitude +5, I could see none naked eye. However, using the SGs I counted 10 which indicates just over 1.5 magnitude gain, matching the theory and indicates the coatings are maximising light transmission. The ability to go quite a bit deeper on stars also demonstrated a very useful secondary property; aiding star hopping. Despite having a computerised 12” scope to hand in Namibia, I spent more time using my 60mm aperture refractor on a manual mount. The ability to see far fainter stars made the job of hopping to objects that were really testing the limit of such a small scope, far easier. Even if you own some low powered binoculars in the 5-6x range, I feel these Vixen’s do something quite different and can still be very complimentary to other instruments available to you. Taking in entire constellations in a single field with additional details not visible to the naked eye is quite an experience and the enhancement to the Milky Way really needs to be experienced firsthand. I do not know an amateur astronomer who has not lost themselves to the beauty of the Milky Way arching overhead from a dark sky site. I never tire of taking in the splendour of those wispy and complex clouds. At the September 2013 AstroCamp I spent more than hour just staring at the sky despite having a new 7.1” triplet Apo sitting in front of me. I was not the only one who ignored their telescope for an extended period of time. Not only will the Vixen SGs reveal the complexities of the Milky Way that are only hinted at with the unaided eye and allow you to take in all but the largest constellations in one view with otherwise unachievable levels of detail, but they are an incredibly useful tool for those who like to star hop. With a magnitude gain of approximately +1.5 over the unaided eye on point sources, they really assist in hoping towards a target when the guide stars are a little too faint to be comfortably seen naked eye. At £229/$299/€275 they are far from an impulse purchase but if you are lucky enough to live at a dark sky site, or travel to one to pursue the hobby, even occasionally, you should give serious consideration to purchasing the Vixen SGs. Just make sure to take a little time to get used to the way to use them (move your head, not your eyes) and if you have a particularly strong spectacles prescription, try before you buy to be sure you can focus them at infinity. Tagged Binocular, review, SG 2.1X42, Ultra Wide Field, Vixen SG 2.1X42. As always Matthew I appreciate the level of detail included in your blogs. It’s refreshing to read, learn and be inspired. Another very interesting and well written article. Anyone thinking of purchasing or needing binoculars will find it difficult not to strian the purse strings to aquire a pair of these! I can’t wait to see more pictures of your visit to Namibia. Another superbly written and well considered blog Matthew. I’m a huge fan of these unique binoculars, and look forward to sharing amazing views of the Brecon skies with them next year! Many thanks for the detailed test with cosmetic specs. As a spec wearer I now know what to expect. I suspect they might not be as advantageous from a somewhat light-polluted site? 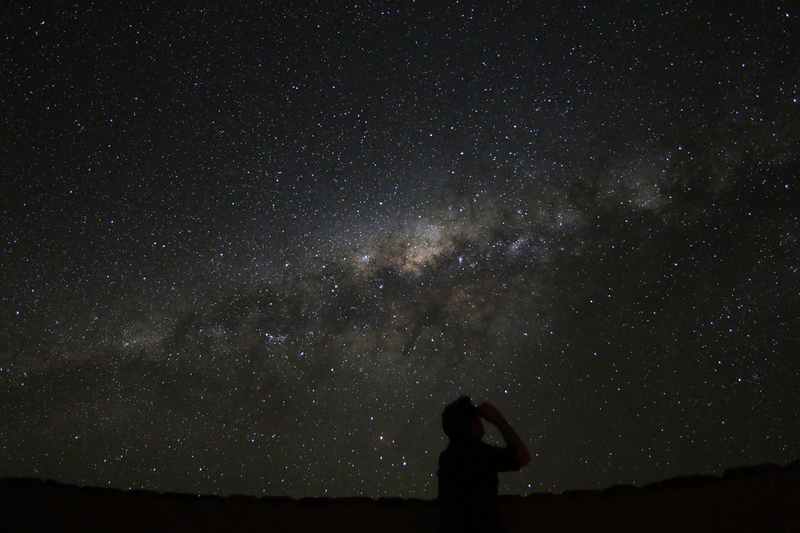 Sorry for the delay in responding, I have just returned from a week of stargazing in Namibia. I am glad you found the review helpful. I agree with your supposition that the SGs are not quite as useful from a light polluted site as just like any optical system they will amplify all collected light uniformly, whether that is starlight or local light pollution. However, they do still give the equivalent magnitude enhancement of around 1.5 to naked eye viewing so they will still show more and can be useful for star hopping, especially if you use a zero power reflex finder. Glad you found the review helpful. More than two years on from writing this review and I still love them. Such great fun to use and offer a view of the universe quite unlike any other optical product. Very nice review for astronomy… I have also an Sony Rx100 and I’m curious how this Rixen work in front of this Len… it,s this a great doubler… perhaps another great feature for this great binocular. Thanks if you have an opportunity to send us an sampler.